For some reason I feel this overwhelming guilt when I turn one photo shoot into two blog posts/recipes. It’s kind of like my former hangup with appearing in two different photos on separate occasions wearing the same outfit. God forbid. I mean, people might think I never shower or something. How could she let herself be seen at TWO different weddings in the same dress??!! 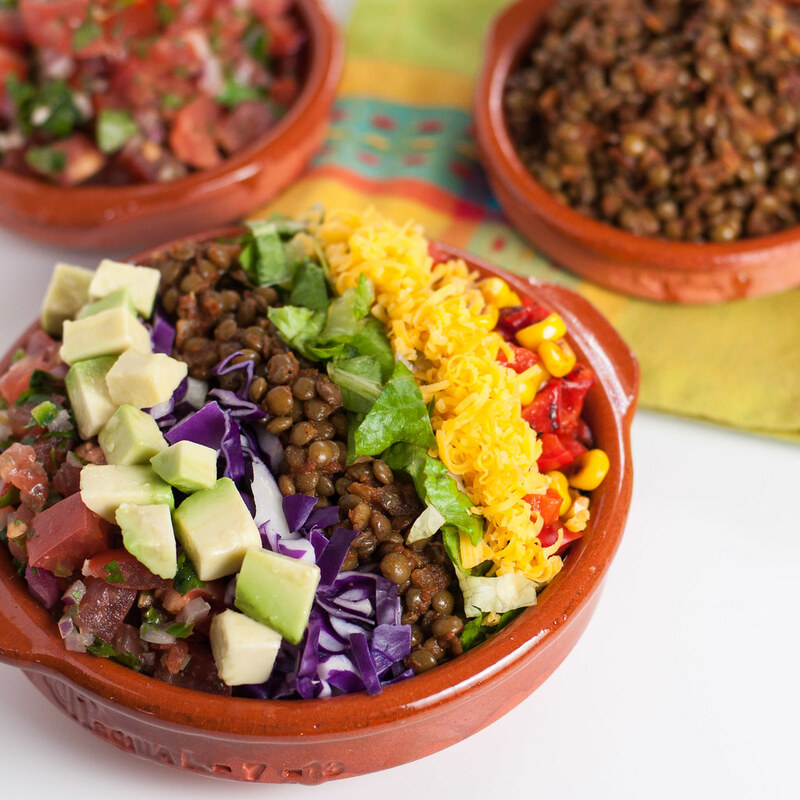 Thankfully, I no longer have issues just wearing what I want, but publishing this taco salad post, a mere week after the taco spiced lentils recipe, with the same serving dish in it, set my confidence wavering. It feels like cheating. Alas, though, I did try to fit everything into one post, and it was far too long and a bit confusing. This way, if you ever want to make the lentils without the salad, or the salad without the lentils, you don’t have to scrub a 12 page post searching for the recipe. 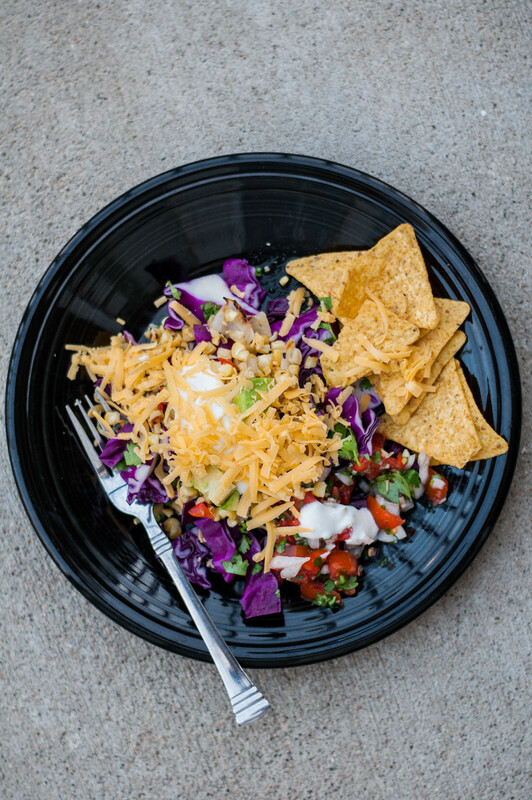 The lentils were also nowhere near their inception when this taco salad materialized while in Minnesota a few months ago. I’ve included some of those photos here, so you don’t have to dwell on how many times you’ve seen this dang cazuela in my photos, and because it’s nice to look at that green grass as I sit here in the near-dark and cold at 4:16 PM. Daylight savings always seems to unofficially declare winter’s arrival, and, in light of that, I know salads aren’t the most comforting food. I’m definitely not craving them, but the best part about this one is the intersection of the crunchy, cool veggies and warm, spicy lentils. 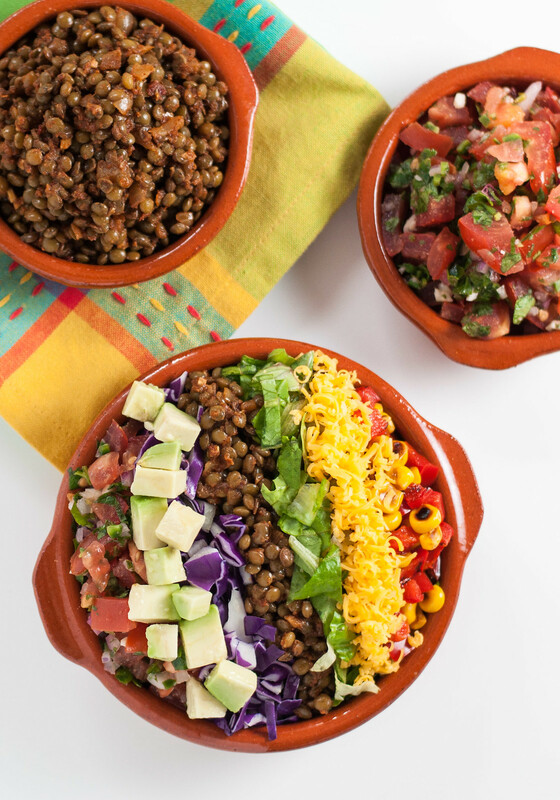 Throw in a dollop of tangy sour cream dressing, then mix it all up, with the heat from the lentils melting the cheddar, and the sour cream holding together every perfect bite, which includes a bit of everything. Normally I’m kind of type A and like to keep my food separated on the plate, but this salad calls for a chaotic, savory mess. Get a good look at that pristine rainbow of components (does that make them sound like car parts? ), because once it’s in front of me, adios organization. If you need some tequila to help deal with a jumbled, free-spirited salad, I am 100% with you there–no shame. Before really digging into the salad post-photo shoot, I didn’t know it would be so good completely mixed together, which is why I’m lacking a photo from that perspective. The first time I picked up the Nikon was back in March. Yes, this March–approximately six short months ago. That puts me right in crazy practice learning mode. From what I’ve gleaned, photography, like most other arts and skills, takes years of practice before you ever gain a real sense of comfort, or at least “okay, I feel like I have an idea what I’m doing here.” Besides 48 hours of anxiety leading up to a shoot (I know, it’s only food! In my own house!) where I can’t stop thinking about angles and which dish towel might work best with the scene and how would such-and-such blogger shoot this quesadilla, I’m also spent after a shoot. Maybe that’s a good thing, indicating that I’ve drained my creative juices to the fullest, but the last thing I want to do is pick up the camera again for a few last shots that hadn’t crossed my mind. I suppose it’s also time to start talking about Thanksgiving, now that November is here. Now that’s event planning I can get behind. Thanksgiving week, I’ll be sharing some of my favorite holiday party apps, all of which are conducive to last minute planning. As in, I will not send you looking for canned pumpkin two days before that fateful Thursday, because it doesn’t exist. After the festivities, I have a little savory, cleansing, but still yummy Friday brunch. I am, most decidedly, not into shopping on Black Friday or any day, but if you are, plan for a leisurely, nutritious post-shopping/pre-nap brunch. Hint: it doesn’t involve leftover turkey. I’m also hosting a little turkey day for four before our favorite hip New Yorker couple runs off to Paris for Thanksgiving weekend, so stay tuned for details about our non-turkey including menu. Roasting whole birds=not my jam, for so many reasons. Alright, I think that’s quite enough out of me for this hump day. In my quest to split subject matter more equitably between food and life, my posts are reaching epic lengths. Whether it’s the story, photos, or recipe, I hope you find something that resonates with you or your taste buds! 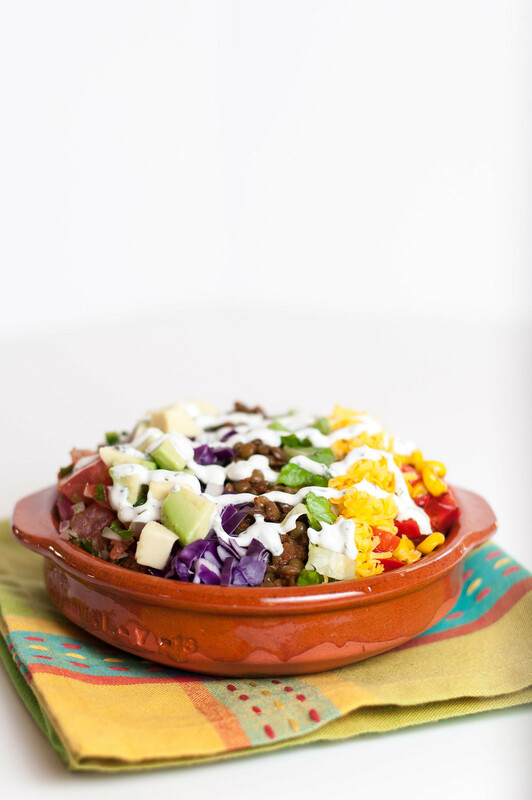 I love the rainbow colors and textural contrast of this salad--crunchy and soft, warm and cool, creamy and spicy. A little bit of everything in every bite! Heat a dry skillet (preferably cast iron) to medium high. Wait a while—you want it really hot. Add corn and red pepper and spread in an even layer. Allow to cook for a minute or two at a time between stirring, about 10 minutes total, until all the pieces are starting to char and the corn is beginning to hiss and pop. Serve hot or chill until ready to use. Mix all ingredients together until well blended. Refrigerate until ready to use and stir before serving. Set out prepared ingredients separately, family or buffet style. 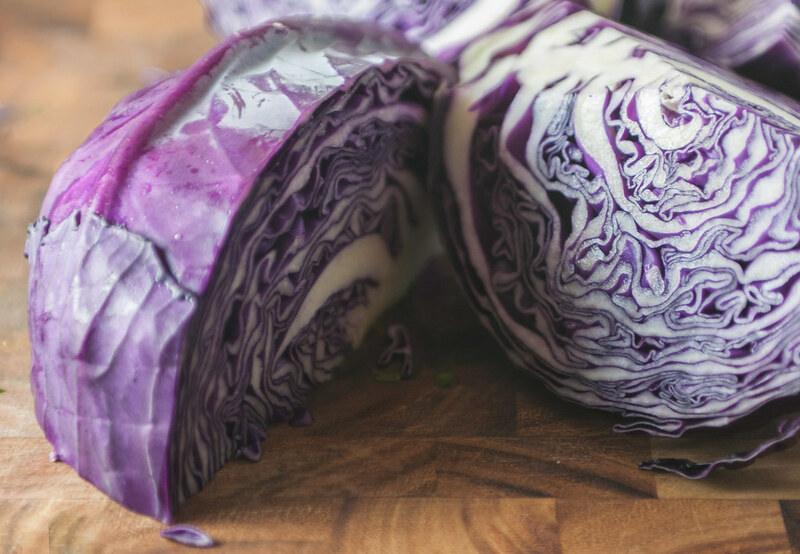 To save a serving bowl, toss the romaine and cabbage together. Before serving, warm the lentils if made in advance. Serve with chips, or start the meal with jalapeno poppers! The Pioneer Woman has a great post and recipe on pico de gallo. 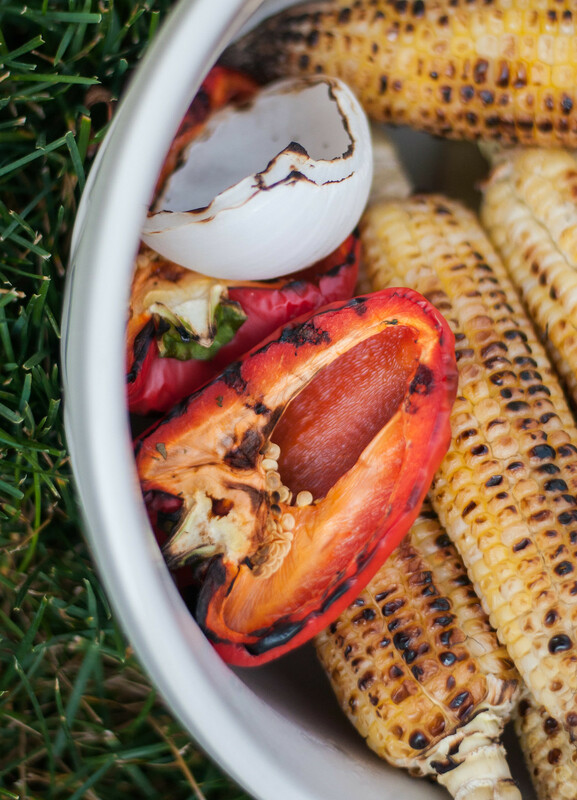 Charring the red pepper and corn adds deeper flavor and enhanced texture, rather than serving them raw. To make the mixture into a salsa, add some minced jalapeno, garlic, and scallion, and stir in a bit of oil, lime juice, salt, and pepper. Feel free to grill the corn and red pepper, if you live in a warmer climate or discover this recipe when corn on the cob is in season. Preparation and cook times don't include the lentils. 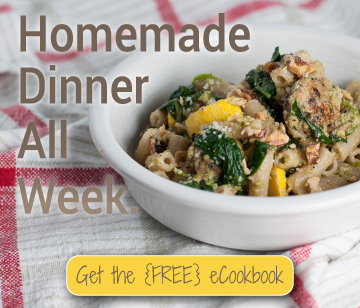 The meal will come together fairly quickly if you make them in advance, and they keep well for up to a week. To make it vegan, exclude the cheese and sour cream dressing, and replace the avocado chunks with your favorite guacamole. 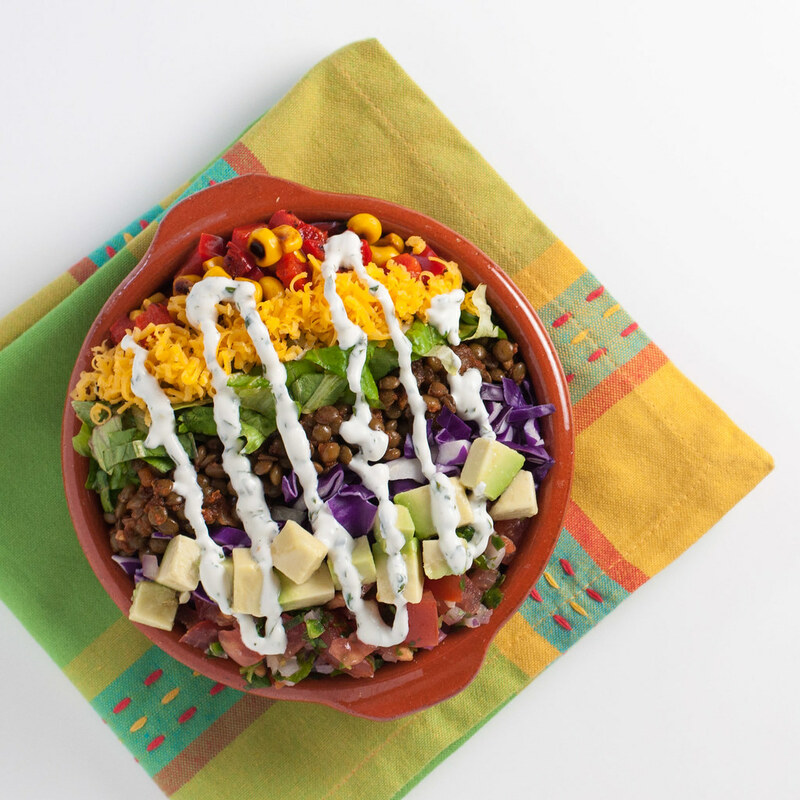 I am loving all the vibrant colours and fresh flavours going on in this rainbow taco salad – definitely a dish I can see making an appearance on my kitchen table. Thanks for sharing it! Tried your recipe today. Soooo delicious. Can’t believe how similar the lentils taste to taco ground beef. At the same time, the prep was super easy, and I have enough left over to last me a week. Yay! I mean, they wouldn’t make it past someone like my grandpa who wouldn’t touch lentils with a 10 foot pole, but these days I prefer them to meat, and so filling. Glad you enjoyed!